1. 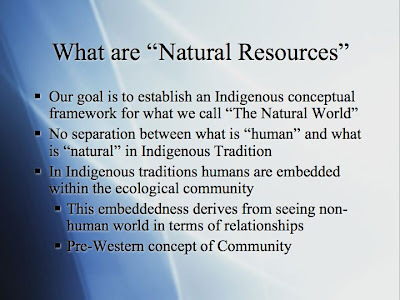 Most Western traditions identify Natural Resources as things like oil, minerals, which are "Non-renewable." 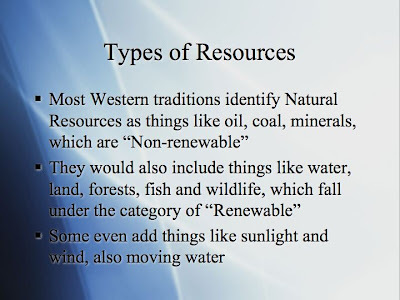 They would also include things like water, land, forest, fish, and wildlife, which fall under the category of "Renewable." 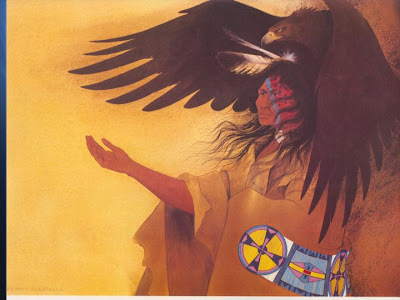 An essential difference between Western and Indigenous perspectives can be illustrated by the Onondaga elder Oren Lyons, who stated, when discussing perceptions of the natural world: "Every time we talk about the nonhuman world we always talk about relatives, whereas you [individuals of European ancestry] always talk about resources"
This is another instance of how economic thinking and concepts dominate Western thinking about the nonhuman world. 2. 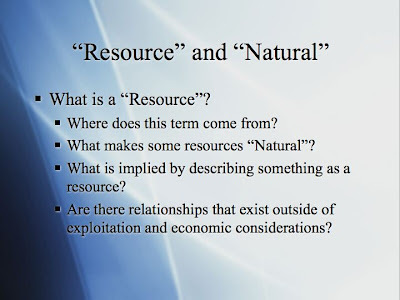 Is a resource something the humans depend upon for survival, or simply something that can be controlled and from which money can be made? 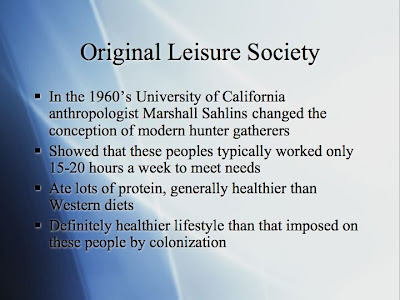 Indigenous peoples also use rsources, but they did not think of them in this manner. 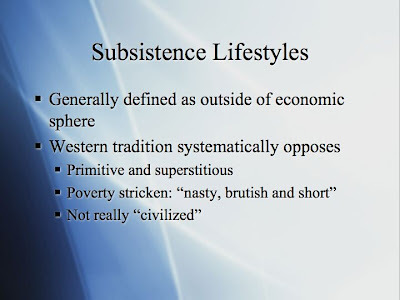 For example, many tribes in North America depended on wildlife, fish, and forests to survive, and they developed schemes that prevented over use. Salmon are a highly variable resource over long periods of time and efforts were made to ensure that the fluctuations in their numbers were not exacerbated by human activities and that people in these communities always thought of salmon with respect. 3. 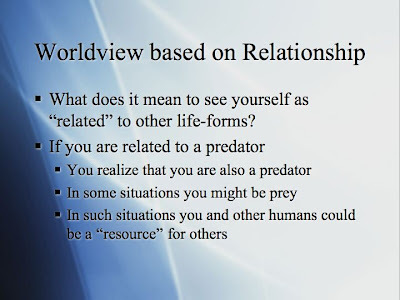 Possible example: Clan systems of many Indigenous peoples identify one type of non-human as a relative. This is one of the devices by which respect is assured and that trains humans to act in a responsible manner towards sources of food, fur, etc. It is possible that trade with Europeans for metal, beads, flour, and cloth damaged these relationships and ledt to overuse of some resources, e.g. beaver were trapped out in many area of North America by Native peoples because beaver fur was valuable in trade. This painting illustrates the close relationship between a human and another species. The ties are so strong that the two can be represneted as one twinned individual. 6. This is the Gatun River in southern Siberia. 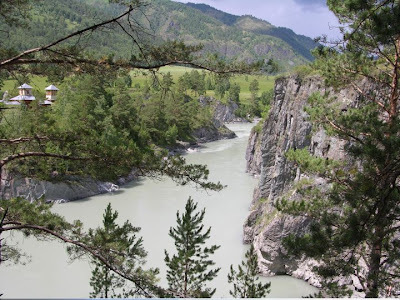 It is an untamed river, which is undammed for its entire length. It is also tied to the spiritual traditions of local Indigenous peoples and even to local Russian ethnics. 7. What is your view of a river? How do you regard it? Does it play a part in your spiritual perceptions of a place? 8. 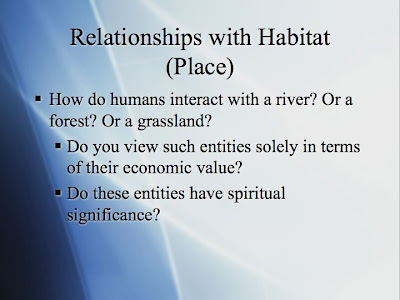 Indigenous people are "spatially oriented" according to the Hunkpapa Lakota Scholar, Vine Deloria Jr. What does this mean? How important are places to you? 9. 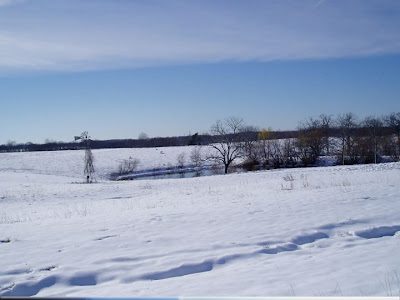 Rural; Landscape in eastern Kansas after a January snow. Is this just a place? A piece of property? A place to graze cattle or raise crops? Or does it have additional meaning? 10. 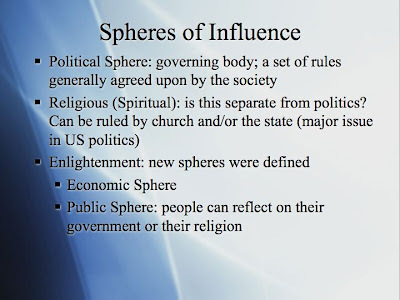 The first two spheres of influence exist in all cultures, even though most of us perceive them in terms of church and government (These were not the original meanings). The Enlightenment was supposed to break the tyranny of religion and superstition and impose rational behavior on its followers. Do you think this has worked? 11. What does it mean to be outside the economic sphere? 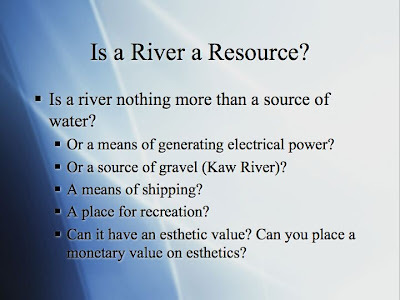 Do hunting and fishing produce things that are of value? Are these solely of monetary value, or are there other kinds of value? Subject to variable environment, sometimes there might not be enough food. Must take lives directly, no grocery store or Farmer's Market to salve your conscience. Serious health problems are probably intractable. 13. 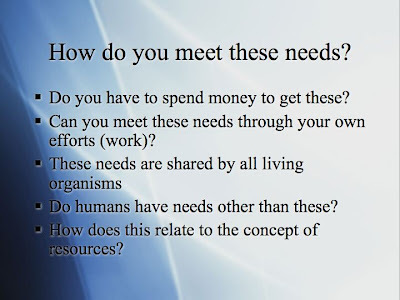 These are needs not only of humans, but of all life forms. Do these represent all of your needs, or are there others that you think need to be considered? 14. 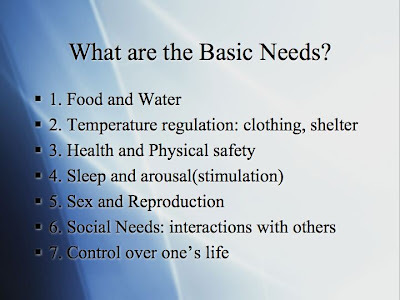 It is possible to meet these needs without a market economy, but it means knowing your world and learning to live with it. 15. 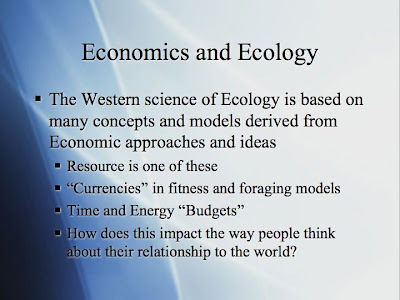 One of the most widely used text in Ecology is called "The Economy of Nature." What is nature's economy? Is it like our market economy? 16. What does it mean for something to be "sacred?" 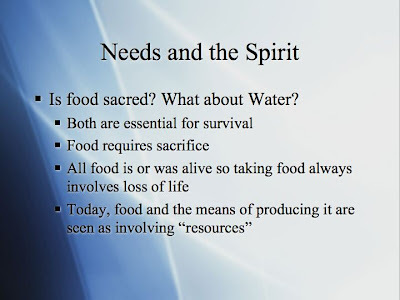 If life is "sacred" how can taking it be justified either for food or monetary gain? 17. This is the crucial question in many Indigenous spiritual traditions. 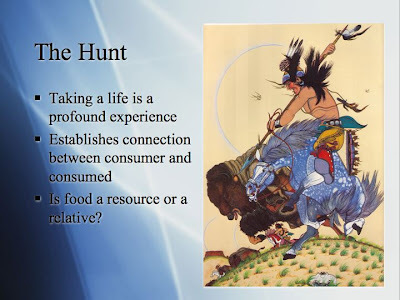 An Inupiat hunter stated that, "The greatest peril of life lies in the fact that human food consists entirely of souls. All the creatures we have to kill and eat, all those that we strike down and destroy to make clothes for ourselves, have souls, like we have, that do not perish with the body, and which must therefore be propitiated lest they should revenge themselves on us for taking their bodies" (Ivaluardiuk, cited in Rasmussen, 1929). ASA an instructor, you might lead a discussion on the ethics involved in such an issue.